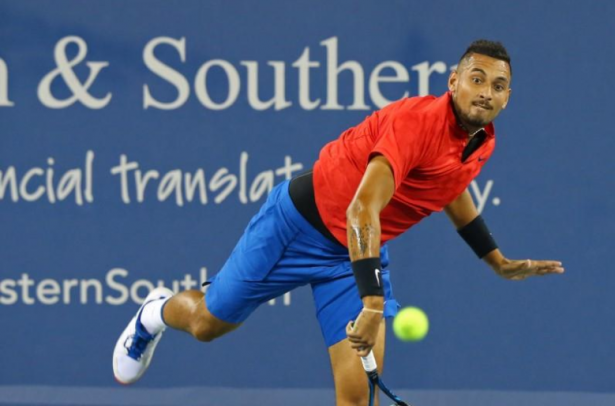 The excitable Nick Kyrgios made short work of top-seeded Spaniard Rafael Nadal in a dazzling 6-2 7-5 victory on Friday at the Cincinnati Open. "He obviously is a tough match always," Nadal told reporters. "Nick is a great player, but I played poorly. "I started the match well and then I played a very bad game in the second set when he broke me. I played some good points. He had some mistakes and I was able to be back in the match. And then I played a terrible game. So it was a bad match for me." The 22-year-old Kyrgios recorded 10 aces in a strong serving display, and moved to the semi-final to face David Ferrer, who produced another shocking result in dominating third-seed Dominic Thiem 6-3 6-3. Kyrgios, known as much for his temper as for his brilliant shot-making, was poised against Nadal. The young contender blew a chance to close the match while serving at 5-4 in the second set when Nadal broke him. But he promptly broke back before closing out the night. Earlier in the day, Kyrgios completed his match, that began on Thursday before it was held over due to rain, defeating hard-serving 6-foot 11-inch Ivo Karlovic of Croatia 4-6 7-6(6) 6-3. Kyrgios did have an outburst in that match when he threw his racquet down in disgust after losing two straight service points in the tiebreak to even it up at 6-6. The outburst appeared to work as he won the next two points and then dominated a deflated Karlovic in the final set. Nadal was somewhat rusty in beating fellow countryman Albert Ramos-Vinolas 7-6(1) 6-2 earlier in the day but few would have expected his result against Kyrgios. On the other side of the draw, red-hot American John Isner beat countryman Jared Donaldson 7-6(4) 7-5 to set up a semi-final against seventh-seeded Bulgarian Grigor Dimitrov, who sailed past Japan's Yuichi Sugita 6-2 6-1.